14 Honest Reasons Why I Eat Alone | Preet Reads. 14 Honest Reasons Why I Eat Alone – Preet Reads. 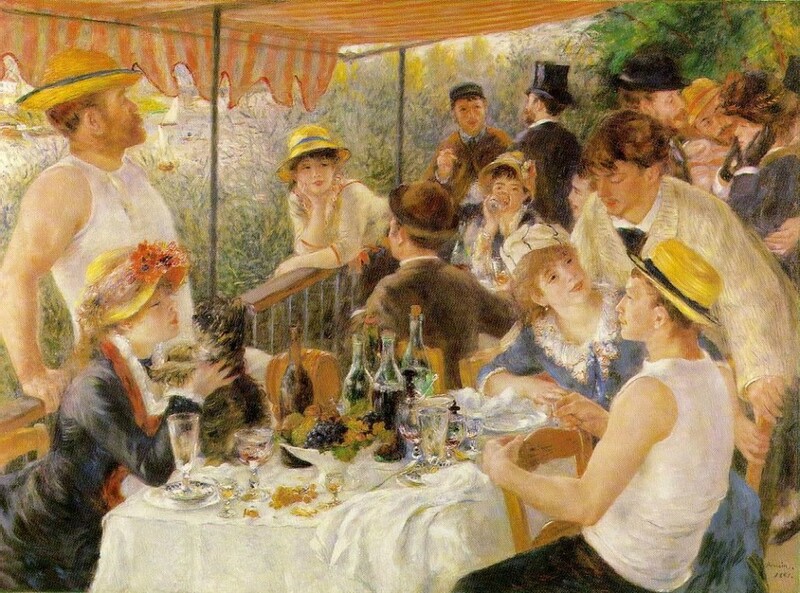 Luncheon of the boating party by Pierre-Auguste Renoir. 1. I can have my meal anywhere. On the roadside, in an elevator, in the bathtub, at a table with or without cutlery. Anywhere. 2. I can chew as loud as I want. 3. I can chew as though sending an open invitation to all air borne creatures: with my mouth wide open. 4. I can read a book or listen to a podcast or have a virtual conversation with a friend sitting continents away – or all three at the same time. 5. Mess is a non-issue. 6. The five-second rule is flexible and no one’s going to secretly judge me while laughing companionably. 7. Time is a non-issue. My meal can be over in 5 or 50 minutes and it won’t matter a whit to anyone. 8. The empty seats around me do not beseech my attention nor cast my way meaning-laden glances to which I am obliged to respond. 9. No eye contact necessary. Unless it’s with my cutlery. 10. Conversations take place within my head at thinking-speed, each requiring little to no resolution as one thought passes the baton to the next with unreal fluidity. 11. No empty, wordless silences during which my lunch/dinner partner and I masticate in what we think is an agreeable silence but we both secretly know is an awkward one. 12. No chance of looking at the other plate and wishing I ordered that spectacularly colourful, fattening and economically friendly meal rather than my own drab, healthy and expensive one. 13. That feeling when I see other tables with every chair occupied, and notice how every occupant is engaged on a supremely important task on their smartphones and tablets, hence ignoring the rest of civil society at the table? Priceless. 14. The freedom to leave at any time without waiting for ongoing conversations to die their natural death before popping the inevitable “Shall we?” question. Exceptions: dining with my mother, or on a sailboat in the middle of the ocean with a non-English speaking fisherman as my sole companion. 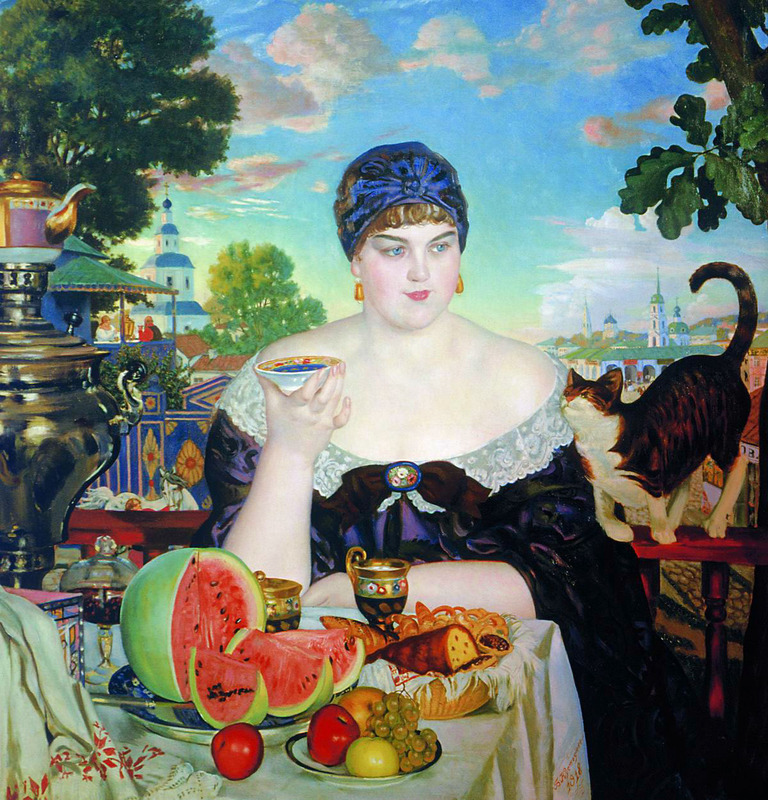 The Merchant’s Wife by Boris Kustodiev, 1918. Look how happy she is.